Let’s start with a little more about skeletal muscle tissue. These are the muscles that contract thousands of times throughout the day to allow us to perform even the most basic of functions. Our muscles are made up of thousands of groups of muscle cells. When a nerve tells a muscle to contract, these groups of cells slide against each other, resulting in a muscle contraction and concomitant thickening of the muscle. When our nerves tell the muscles to let go of the contraction and relax, the sliding occurs in the opposite direction, lengthening the muscle into relaxation. When a muscle cramp takes place, something goes wrong in the relaxation phase, causing an extended, painful contraction experience. At the Fit Stop, I get questions about muscle cramps a lot, and I basically hear about two different kinds. The first is the athlete or weekend warrior who gets cramps frequently when training, and muscle fatigue sets in. These cramps are typically referred to as “Exercise Associated Muscle Cramps” or EAMC. The other kind of cramp I hear about is the kind that typically occur with our older patient population and happen seemingly out of the blue. These seem to come on more typically in the evening when the person is trying to relax and get some rest. These two kinds of cramps may at first glance seem to be on opposite ends of the spectrum and quite different. However, they may have more in common than we think. For many years now, EAMC have been thought to be caused by an electrolyte imbalance and/or dehydration. Electrolytes are minerals, like sodium, calcium, magnesium, carried in our blood and other body fluids. These minerals play a role in the normal contraction and relaxation of muscle tissue. We lose electrolytes from our body when we sweat. However, as muscle cramping has been studied over recent years, this theory has been brought into question. Studies conducted on athletes that develop cramps versus those that don’t don’t show any difference in electrolyte levels. An EAMC theory that seems to be gaining more and more support through current research is known as the altered neuromotor control theory. This new research came about because of the common complaint of muscle fatigue as a precursor to cramping. This theory goes something like this: n athlete goes out to train intensely. Muscles in the lower legs (calves) and thighs (hamstrings) are working very hard, contracting and relaxing hundreds of time to meet the demands of competition. At this point, muscle fatigue starts to set in. All of our skeletal muscles have tiny little receptors that sense when the muscle is either stretched out (relaxed) or contracted (shortened). In an overly fatigued muscle on the verge of a cramp, the contraction receptors start to send out of control signals to the brain that indicate the need to keep on contracting these muscles to meet the demand placed on them. This overly excited state of the muscle, also prevents the brain from receiving the normal inhibitory, or relaxation signal from the muscle that it normally gets when not overly fatigued. Because of this, a constant signal to contract gets sent from the brain to the overworked muscle, causing a cramp. Basically then, a cramp in this theory, rather than an imbalance of minerals, is a result of an overworked muscle sending nerve signals to and from the brain, that are out of control. Can this theory have anything to do with the cramps that seem to come on in the senior population? Though this type of cramp is a little harder to explain, there definitely may be a link. Because we lose muscle mass throughout the aging process, our leg muscles are left to work even harder in our later years in order to generate the same amount of force. That extra strain could theoretically cause these muscles to fatigue at a quicker rate, and put them in the over-excited state similar to that of someone cramping from exercise overexertion. Though seemingly a cramp that comes on without any reason, these resting cramps may just be an accumulation of effort and stress throughout the day, on muscles that simply don’t have ability to work as hard as they used to. So is there anything that can be done to prevent muscle cramping? In the moment of the cramp, we all know that simply stretching the painful muscle will help. Stretch receptors on the muscle itself send messages to the brain that help the the affected muscle go into relaxation mode. Also, a surprising antidote, pickle juice will very quickly help ease a muscle cramp (and not because it replaces electrolytes, but probably because the salty solution causes a relaxation reflex to occur, again reinforcing the nerve control theory). However, if we are talking about things that can be done to prevent these cramps from coming on this first place, the recent research reinforces the idea that we need to get these muscles stronger. Since muscle fatigue seems to play a role in the whole cramping cascade, the main preventive (and intuitive) measure for cramping is strength training. The majority of cramping seems to occur in the lower legs and hamstrings, so today I’ve included a couple of simple exercises to consider adding to your exercise routine if your are prone to muscle cramps. 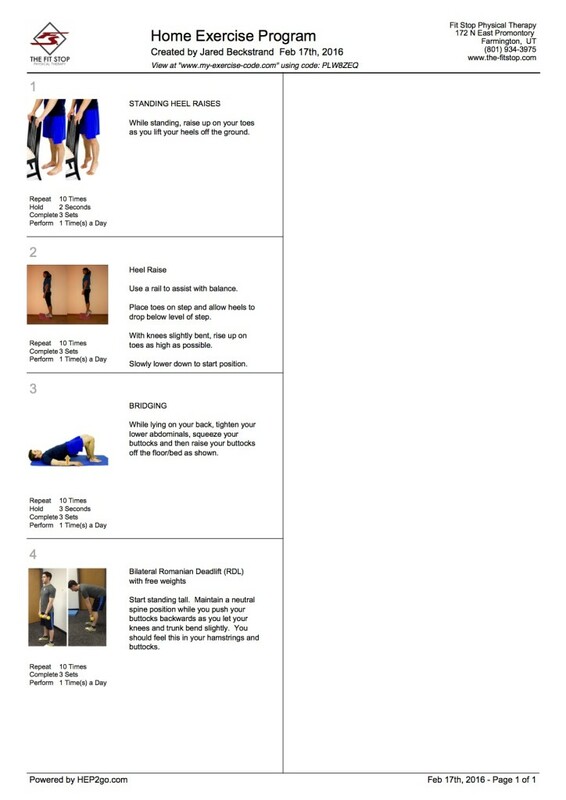 Click on the image for your free copy of this exercise program! 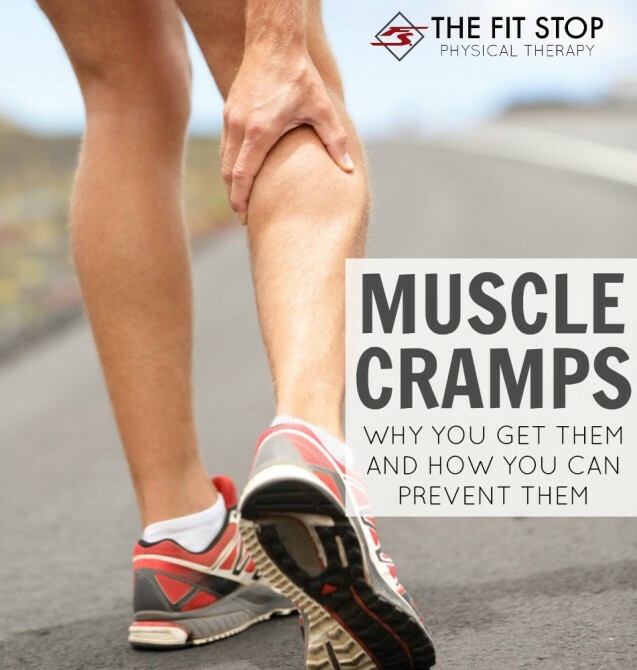 Stop by your convenient Fit Stop PT location anytime to visit with any of our therapists if you have any questions about muscle cramps or the exercises included in our post today.